Ozzy Osbourne impersonator Little Ozzy was contacted by the History channel earlier this year to appear in Ozzy and son Jack's new reality show called "Ozzy And Jack's World Detour". The series airs on Sundays and features the duo traveling the world together, exploring the history behind some of the planet's most storied sites, while checking out some lesser-known locations along the way. After singing to Sharon Osbourne on "America's Got Talent" several years ago, Little Ozzy got a casting call from the Prince Of Darkness himself to appear with him and Jack on the program in which father and son — self-proclaimed history nerds who have apparently waited years to take this trip — visit locales like Mount Rushmore, Stonehenge, the Alamo, Roswell, the Jamestown Settlement and Sun Studios. They also stop at places like a missile silo, England's famed Bletchley Park and a private museum of working artillery tanks. 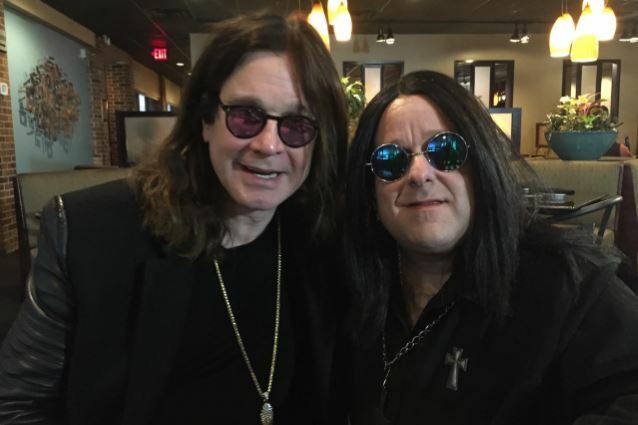 The "Ozzy And Jack's World Detour" episode featuring Little Ozzy was filmed in Virginia in early March and is set to air on September 11. Little Ozzy was created by Lin Doak, 49, an ex-MINIKISS member who left the band after four years of touring the country with them to create a new live act. He is 4 feet and 8 inches short and he performs all over the country, belting out all of Ozzy's hits as well as those from BLACK SABBATH. He received national attention in 2012 when he performed "Mama I'm Coming Home" on the primetime NBC show "America's Got Talent" to Ozzy's wife Sharon, who was one of the judges on the talent competition.